Hard times require fresh looks. Longy School of Music of Bard College has been adopting an ecumenical approach in recent years to entice audiences out of their (perfectly unstuffy) Pickman Concert Hall by aligning provocative modern programs within a cabaret setting at the neighboring Regattabar in the Charles Hotel. One such program last Monday at the jazz club joined a faculty string trio and student clarinet quartet with a video artist in a curiously pleasing evening of audio-visual encounters. The low-key evening got underway with drinks and small plates (irresistible nut-bowls from Fastachi) for the hundred or so attendees, whose ears became attuned to R’bar’s usual jazz mixtape of, say, Horace Silver, Benny Golson, Pony Poindexter, Bill Evans, Modern Jazz Quartet. President Karen Zorn cheer-led welcoming patter and violinist Anna Williams explained the premise and its set-up, which included flipping the room 180° so that the audience faced the windows (shades drawn on Harvard Square) and raising two sizeable video flat-panels well above eye-level. Williams described the event as ‘chamber music with a point of view’ bookended two colorful suites by Argentine composer Astor Piazzola (1921-1992) with post-romantic / impressionistic movements by Leonard Bernstein and Claude Debussy. The music served as sound tracks for color slide narratives and black-and-white videos illuminated onto elevated screens by Bing Lin, seated midroom at a laptop console. As Piazzola’s “L’Histoire du Tango unfurled its chronology of the dance, love stories of three real-life couples unfolded on-screen. “Bordel 1900” paired a cheery, bustling fin-de-siècle theme with bright young European emigres. The sultry, taffy-pull tango of “Café 1930” followed a couple’s anguished travails through physical pain and therapy. “Concert d’aujourd’hui” traced lesbian lovers’ story through an upbeat, spiky Poulenc rondo. The clarinettists were Kenneth Toland, Juan Camilo Gonzalez, Raul Marcano, and Luisa Buitrago, who also conceived of the concept. Bernstein (1918-1990) was just a pimply sophomore across the Yard, 200 yards away, when he wrote the steamy Brahmsian Trio (Op. 2). The Neave Trio (pianist Eri Nakamura, violinist Williams, cellist Mikhail Veselov, Alumni Artists and Faculty Ensemble-in-Residence) take on the just the opening adagio non troppo sufficed to convey the hormone-driven passions and frenzied fugato of scrawled note cards. From Debussy’s Trio in G Major, the somber cello opening the andante espressivo spread a velvet drape first over the shrouded moon, but as the piu mosso became more animated, the stars swirled in the night sky, light dissipated the clouds, illuminated the glimmering aurora borealis, and most effectively, spot-lit large snowflakes. All in five transfixing minutes. Piazzola’s Estaciones Porteñas (Four Seasons of Buenos Aires) let the music do the talking, with each season in the vibrant city anchored by a single riveting color slide. The freewheeling trio emulated the composer’s well-known improvisatory spirit with expressive freedom, summoning at will col legno insects, swooning glissandi, and eye-popping accelerandi with swaggering duende. 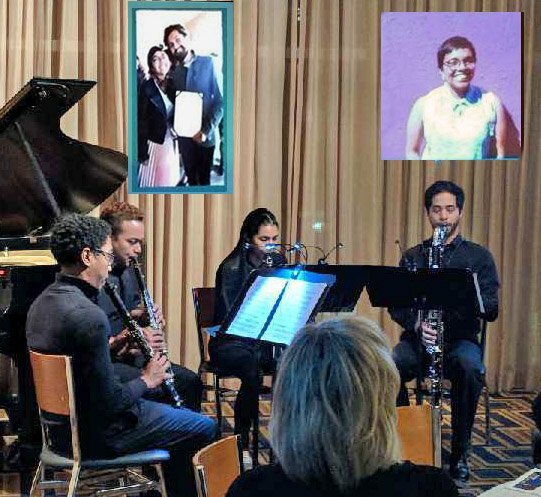 Longy’s annual gala celebrates its 5th anniversary of Sistema Side by Side at Sanders Theater on Monday, March 12th at 5:30pm. Guest artist is Thomas Wilkins, Principal Conductor of the Hollywood Bowl. The school’s next Regattabar gig comes Monday, April 23, 7pm. Learn more and register for tickets HERE or phone Melissa Williamson, 617-831-1771. Fred Bouchard, lifelong music journalist for Downbeat Magazine, The New York City Jazz Record and other publications, has until recently contributed to Massachusetts Beverage Business and Fodor’s Boston. Now retired from teaching music journalism at Berklee College of Music, he pursues interests in writing on travel, nature and wine.